I was interviewed yesterday about the Alzheimer's walk this weekend. Last weekend, I had another tag sale (mostly books and jewelry supplies) and raised another $120 (miserable rainy weather) for my team, adding to the $200 or so donated through Facebook friends. Roberta Piedmont managed to raise more than $1,000 on her own this year for Alzheimer’s research. What if more people pitched in to help eradicate the disease, she wonders. “I had a friend tell me ‘with enough shovels, you can move a mountain,” she said. A year of fundraising for the Alzheimer’s Association will culminate for Piedmont this weekend when she takes part in the Walk to End Alzheimer's in New Haven on Sunday. “I’m looking forward to it. It's a chance to meet other people and talk and share stories,” she said. Piedmont’s team includes her mother, her husband and some friends. Piedmont said that while many people know of Alzheimer’s, only those who have seen its effects understand the severity of the disease. “When I tell somebody, they either look at me with a blank look on [their] face, or their own story comes out,” she said. Piedmont’s father, Bob Rizza, worked for more than 30 years in the car business in Meriden and Wallingford before he had to retire at age 62 due to the beginning stages of the disease. 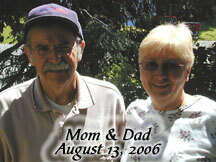 He was diagnosed a year later, on June 21, 2004, and died on Nov. 26, 2007. 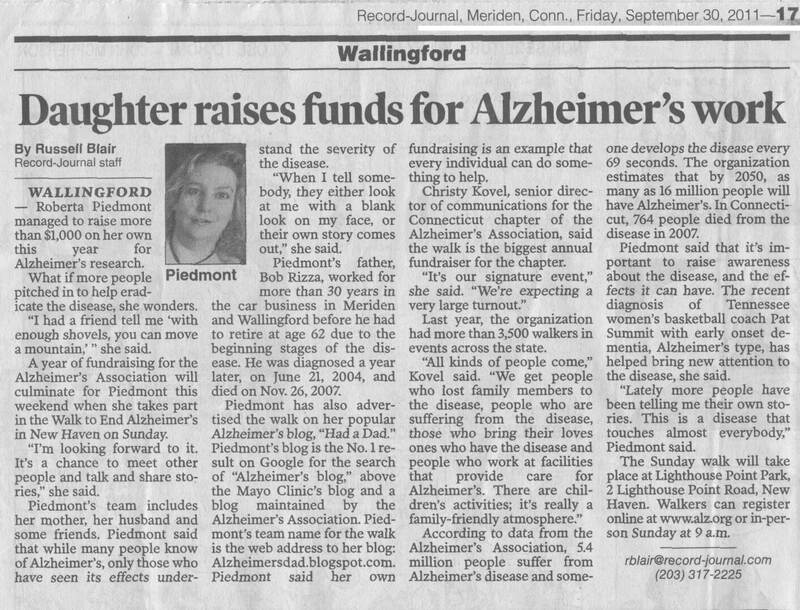 Piedmont has also advertised the walk on her popular Alzheimer’s blog, “Had a Dad.” Piedmont’s blog is the No. 1 result on Google for the search of “Alzheimer's blog,” above the Mayo Clinic's blog and a blog maintained by the Alzheimer’s Association. 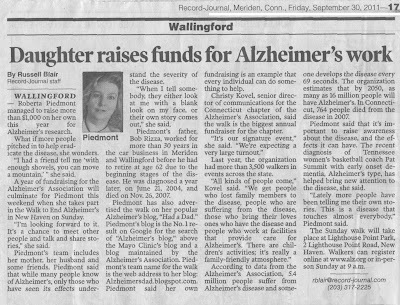 Piedmont's team name for the walk is the web address to her blog: Alzheimersdad.blogspot.com. Piedmont said her own fundraising is an example that every individual can do something to help. Christy Kovel, senior director of communications for the Connecticut chapter of the Alzheimer’s Association, said the walk is the biggest annual fundraiser for the chapter. Last year, the organization had more than 3,500 walkers in events across the state. According to data from the Alzheimer’s Association, 5.4 million people suffer from Alzheimer’s disease and someone develops the disease every 69 seconds. The organization estimates that by 2050, as many as 16 million people will have Alzheimer’s. In Connecticut, 764 people died from the disease in 2007. Piedmont said that it’s important to raise awareness about the disease, and the effects it can have. The recent diagnosis of Tennessee women's basketball coach Pat Summit with early onset dementia, Alzheimer's type, has helped bring new attention to the disease, she said. “Lately more people have been telling me their own stories. This is a disease that touches almost everybody,” Piedmont said. The Sunday walk will take place at Lighthouse Point Park, 2 Lighthouse Point Road, New Haven. Walkers can register online at www.alz.org or in-person Sunday at 9 a.m.
if you would like to donate to my team please click below or in the sidebar. Congratulations!Thank you for being a voice for Alzheimer's. I hope my blog can be as effective as yours someday. What a great job you're doing! Alzheimer's research is one of the best things you can support. The Evangelical Homes of Michigan thanks you for the work you're doing in this field!